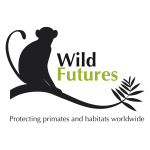 Wild Futures is the UK primate welfare and conservation charity, (reg no. 1102532), with the holistic approach that combines an educational, environmental and sustainability remit dedicated to promoting the welfare, conservation and survival of our closest living relatives, the non-human primates; working to end the primate trade and abuse of primates in captivity, promoting the rehabilitation of captive primates and the preservation of those in the wild, whilst operating a sanctuary for primates in need of a long term home. Our flagship project, the Monkey Sanctuary in Looe, Cornwall, is the only sanctuary in Europe to be awarded accreditation status by the Global Federation of Animal Sanctuaries in recognition of our high welfare standards, educational and campaigning work.